Getting that first scope is an exciting experience. I’ll bet you didn’t know this Thursday, 28 April 2016, is International Astronomy Day? Well it is! Astronomy allows us to see the history of the universe with our own eyes and experience it all. The stars that twinkle as you look out on a dark, clear night may not be there any more. They existed at whatever point in history they emitted that light, which has taken millions, sometimes billions of years to reach Earth. Celebrate this marvellous feat on International Astronomy Day by participating in a little stargazing. Check out your local astronomy group in whatever town or city you live, or simply find a quiet, dark spot to look out onto the sparkling canvas that lies above our heads. Use books or web apps to identify the players in the Universe’s spectacular light show. Call Ken on 0417 997 8315 to arrange a viewing night. GoTo telescopes are usually advertised as being fully automatic and once they have set themselves up, or are set up by the user, they can access and track and many thousands of stars or objects with just a simple touch of a button. These features have made GoTo scopes are very desirable with many first time telescope users and perfect for budding astrophotographers. Do you really need a GoTo or would an ordinary manual telescope suffice? In order to make a good decision on what telescope to buy, you need to decide on what you want to use the telescope for – observing, photography, or both and does it need to be portable or not? But then again, Go To telescopes are like having someone like me with you in the backyard, so think it over OK? Compared to GoTo telescopes, manual telescopes are much more economical as you are basically buying a very simple mount and a telescope tube assembly. With GoTo you are adding electronics and control mechanisms to drive the scope, which can add heavily to the cost. A small GoTo telescope could cost the same as a lot larger manual Dobsonian telescope, but think of the advantages of hitting a button and bingo, there’s your object smack dab in the viewfinder. Easy! If you don’t have much time or patience to learn where stuff is located in the sky, or what to find objects quickly, then an automatic system might be better for you. 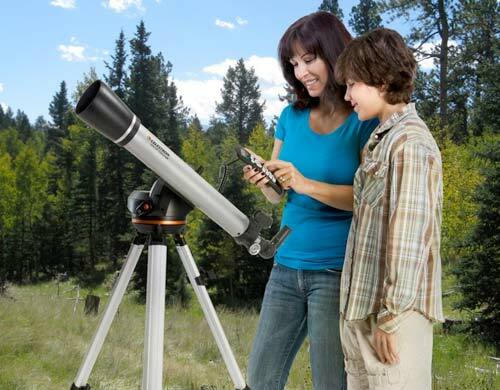 Buy from a store which specializes in telescopes and astronomy, either locally or like mine www.davidreneke.com online. Don’t buy from department stores or discount as mostly what they sell is junk. Find your local astronomy club and try out different telescopes at one of their star parties. By the way, as appealing as it is, I strongly recommend that beginners steer clear of astrophotography until they have learned their way around the sky. Astrophotography is by far the most expensive and difficult area of amateur astronomy. April is the fourth month of the year in our calendar and one of four months with a length of 30 days but, April wasn’t always the fourth month! True. In the earliest Roman calendar, April was the second month before it became the four month around 450 BC, but had only had 29 days. Julius Caesar added the 30th day around 45 BC. Just thought you’d like to know that.